Menagerie Mind: Matching Chain Maille and Crystal Necklace - "Glitter Maille"
Matching Chain Maille and Crystal Necklace - "Glitter Maille"
Earlier I posted the bracelet, but here is the set! 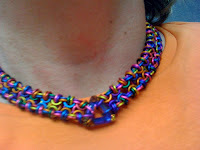 I've called it "Glitter Maille." The weave is Enigma (or Gridlock Byzantine), and it is a variant of the basic Byzantine weave. 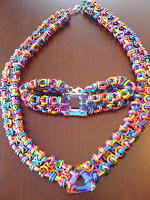 This is one of the weaves I learned in the book, Chains by Becky. To get the ange for a necklace (instead of a choker), I used a triangle crystal instead of a square. I wasn't able to find Volcano, so this color is called Bermuda. They are still close. The anodized aluminum in seven different colored jump rings from The Ring Lord. This is a really fun set to wear. I made another set to donate to a local fund raiser and it auctioned off at something like $250!